Microsoft Outlook Installation is needed for recovery of dbx file as PST. 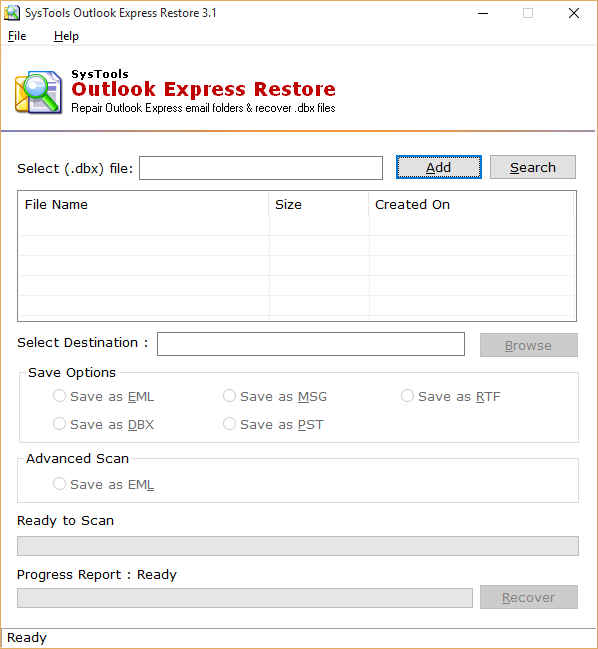 Outlook Express 6.0 & all below versions are supported by DBX File repair tool. DBX file recovery tool allows to repair corrupt outlook dbx file and provides the flexibility to restore it in multiple formats. After recovery, you can export the dbx files into multiple email platforms. 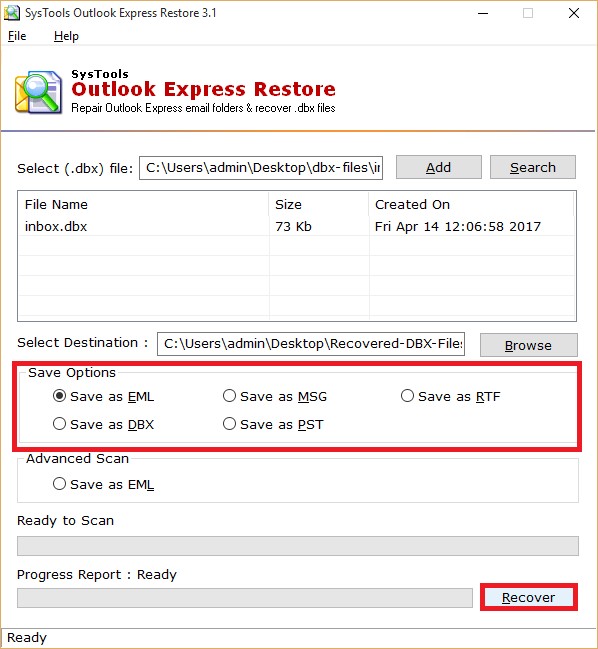 With the help of the best dbx recovery tool, you can perform the batch recovery of Outlook express dbx files. For this, you will have to select the folder containing multiple dbx files. The software loads it and lists it with the file count. The DBX repair tool provides the enhanced functionality to repair corrupt dbx files. For this, you will have to use advanced scanning mode to repair and restore corrupt dbx files. The Outlook Express dbx file recovery software performs the deep scanning of dbx files and allows to save it in multiple file formats. Outlook Express DBX repair tool allows previewing the dbx files with multiple attributes on its panel itself. The software allows to preview the dbx files with information such as address, their size in KB, File creation date with day, date, month, year and time as well. The deleted dbx file recovery software genuinely preserves the meta properties linked with the emails and other as well. It does not change or alter the internal formatting of emails contained in dbx file. The DBX file attachments are embed in the same file while recovering it. 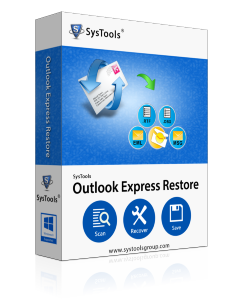 The Outlook Express Inbox Repair tool proficiently repair and restore dbx files. It provides the multiple file saving options to save recovered data. The corrupt dbx file can be recovered as EML, PST, MSG and RTF format. Demo version of Outlook Express DBX File Recovery Software allows you to only export 15 Emails only. I have deleted some my important emails from Outlook Express DBX files accidentally. Can I use DBX Recovery tool for the safe retrieval of my emails? Yes, definitely. With the help of DBX Repair tool, you can recover deleted emails from DBX files. Apart from this software is best in its category for the safe retrieval of deleted items from corrupt dbx files. When I was trying to open the Outlook Express to access my emails but it throws an error Outlook Express could not be started because Msoe.dll could not be initialized. How can I fix this error? As such, there is no conventional solution are available to fix it in quick time. So You must have to go with the professional solution such as Outlook Express Recovery Tool. 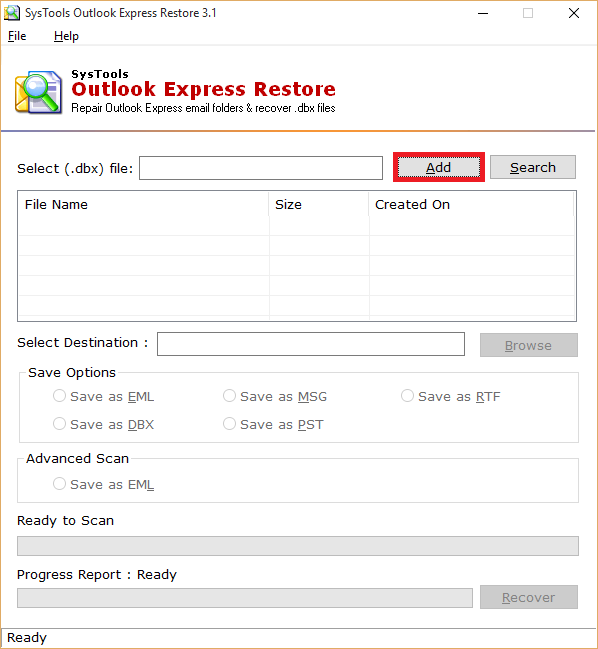 Does Outlook Express DBX repair tool require installation of Outlook Express? No, Outlook Express installation is not necessary to repair and recover dbx files into multiple file formats. 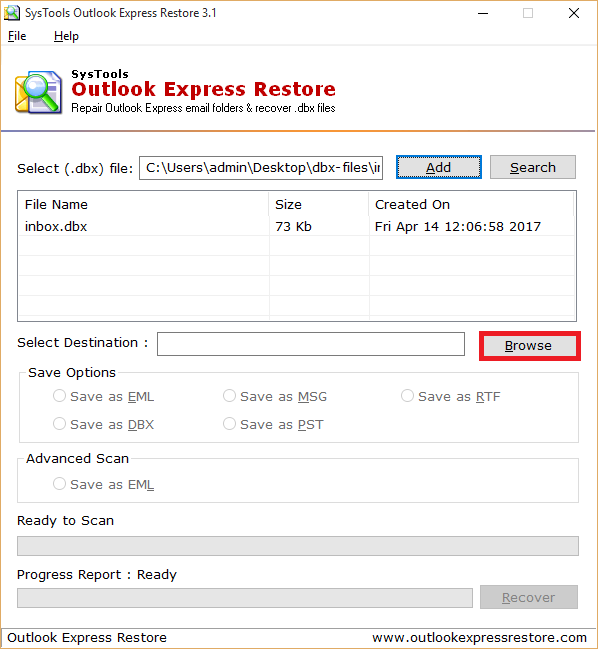 The Advanced Outlook Express recovery software works perfectly for me to retrieve permanently deleted items from the corrupt dbx files. I have mistakenly deleted some of my emails from the dbx files years ago. But I was in need that emails for my business deal. I go with DBX file recovery software without any hesitation. I successfully recovered my deleted emails from dbx files. Thanks for such nice software. I was facing huge data disaster since my laptop get crashed due to system failure. I have lost my complete data such as documents, images, and other media files. Most importantly, I also lost my crucial emails and attachments. I was looking for the solution to recover data from corrupt Outlook Express. Then someone has suggested me to use Outlook Express DBX file repair tool. I used the software & got my email data back.